The hits just keep coming for the New York Yankees. 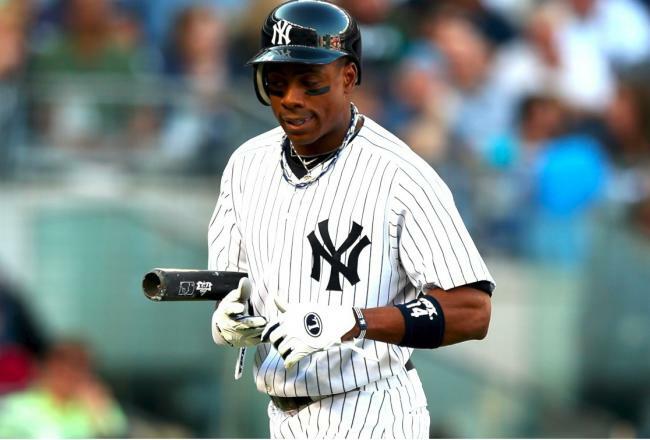 After a noticeably low-key offseason where the club hardly made any noise on the free agent market, the Bronx Bombers suffered another blow this past weekend, losing slugger Curtis Granderson to a broken forearm. Granderson, who suffered the injury after being hit in the wrist by a pitch, is projected to miss 10 weeks with the injury, with a potential return to the lineup sometime in May. The Yanks had already let veteran free agent outfielders Nick Swisher and Raul Ibanez walk during the offseason, so this latest dent to the lineup is even more devastating. Though Granderson only hit .232 a season ago, he did belt 43 home runs for the club a season ago, and that power will not be easy to replace. Making matters worse, there are not a lot of obvious replacements for Granderson to start the season, either currently on the roster or available via trade or free agency. Journeymen Matt Diaz and Juan Rivera are now in line to receive more playing time, but neither of them represents a worthy replacement in the outfield. Former Yankee Johnny Damon has already stated his desire to return to the ballclub if asked, but it does not appear the Yankees are going to be calling up the 39-year-old outfielder anytime soon. Others outfielders on the free agent market include Grady Sizemore and Scott Podsednik, but they are not likely solutions either. As far as trade are concerned, there is no bigger name out there for New York than Alfonso Soriano. The former Yankee still has two years and $37 million left on his current deal with the Chicago Cubs, but the Cubs would love to move his contracts off the books. Though Soriano vetoed a trade to the Giants last summer, he may be willing to waive his no-trade clause to go back to the Bronx. While a trade for Soriano is also unlikely, it is a scenario that will continue to be discussed throughout baseball, and his power would replace a lot of Granderson’s value. The Yankees always seem to find solutions to their roster issues, but the loss of Granderson will surely put the organization’s creativity and resourcefulness to the test as they try and tread water in the brutal AL East. This entry was posted in MLB Tickets and tagged new york yankess, prominent tickets, prominent tickets service, yankees by promc58blog. Bookmark the permalink.